The turbulent histoy of the Hotel Böglerhof starts many centuries ago when the building was used as a workshop by a craftsman making bows and arrows. It was later a courthouse for miners during the reign of the Fugger dynasty, before becoming an inn. This long and proud history can be seen and felt by visitors to the Hotel Böglerhof, from the age of silver mining to the battles under freedom fighter Andreas Hofer and the modern incarnation of the hotel run by the Duftner family. The Hotel Böglerhof takes its name from the Bögler, which was the name given to a maker of bows. This was the first recorded use of the site where the hotel stands today. During the successful mining period in the Middle Ages under the Fugger family there was a mining court located in the building. Our large wine cellar and the wood-pannelled Fuggerstube room date back to this period in the 15th century. When the silver rush came to an end, the Böglerhof became an inn. In 1809 the Tyrolean freedom fighter Andreas Hofer wrote a letter to Herr Pögler in Alpbach to call on the residents of Alpbach to take up arms in the struggle against the Napoleonic forces. This letter is still kept in the Hotel Böglerhof today. In 1933 the young wine trader Alfons Moser bought the Böglerwirt – the start of a success story which continues today under the leadership of the Duftner family. The rundown hotel is taken over by the Duftner family. Thomas Wolfe, an American author, spends time at the Hotel Böglerhof writing and drinking. Construction of the first open-air swimming pool using wood. At the time there were many complaints from the bishop, so a decision was taken to turn the pool into a duck pond. It would later be used once again for its original purpose. First ski lift is built next to the Hotel Böglerhof by Alfons Moser. Lady Vernay, the first Englishwoman to come to Alpbach, visited a travel agent in Innsbruck to find a typical farmhouse. Alfons Moser, who unusually for the time had a car, took Lady Vernay to Alpbach, It proved to be the start of a long friendship which would last for several generations between Alpbach and the schools in Frensham Heights, Malborough and Sevenoaks. Major Ingham also came to Alpbach as a result of his links to these schools and visited Alpbach. Since then the village has welcomed many guests from England. Foundation of the "Austrian College", today the European Forum, which takes place every year in the second half of August. A major fire destroys almost the whole hotel and farm. Only the tower and the "Fuggerstube" survive. Reconstruction of the Hotel Böglerhof with the help of the whole village. The hotel is then reopened. First chairlift built leading onto the Wiedersbergerhorn mountain and creation of the lift-operating company. The "Austragshäusel" is turned into a nightclub: the Böglerkeller. Adjacent house built as a home for the Duftner family, including sauna area for guests. Second chairlift built leading onto the Wiedersbergerhorn mountain. Expansion of hotel to include 25 new rooms, hotel hall and indoor pool. The Hotel Böglerhof is severely damaged by fire and re-built. The Hotel Böglerhof becomes a member of the Romantic Hotels. Exhibition of Wolfgang Pfaundler's black-and-white photos "Alpbach wie es früher war" ("Alpbach in Days Gone By"). These photos can be seen in our rooms. First Shamanism Congress. Meeting of naturopaths from around the world with international researchers such as Fidjof Capra, Michael Harner, Pater Steindl, etc. The Dalai Lama and Indira Ghandi visit the Hotel Böglerhof while attending events in Alpbach. Redesign of kitchen and modernisation of the food & beverage area. Construction of gondola – replaces the old chairlifts. The Hotel Böglerhof gets its own separate management team (previously shared with the congress centre) and builds its conference facilities in the Fichtensaal. Construction of the Schafalm hut – small seminar room as an alternative to the larger Fichtensaal room. Located on lower floor with subterranean connection to the Böglerkeller. Expansion of the wine cellar in the old "Fuggerkeller" cellar. Construction of the Finnish sauna in the garden and renovation of the rooms. Expansion of the Vitalquell Spa with gym, cosmetics and massage rooms as well as an area for exercise classes. Construction of the outdoor swimming pool in the garden. Addition of 24 new rooms, a new restaurant, an underground garage and the quiet garden, We and our guests think that the Hotel Böglerhof has now reached its perfect size. However, we are always on the lookout for things to improve – and that will stay the same in the future. After all, we want visitors to feel at home! Expansion of our restaurant to include a large buffet area with a show kitchen. 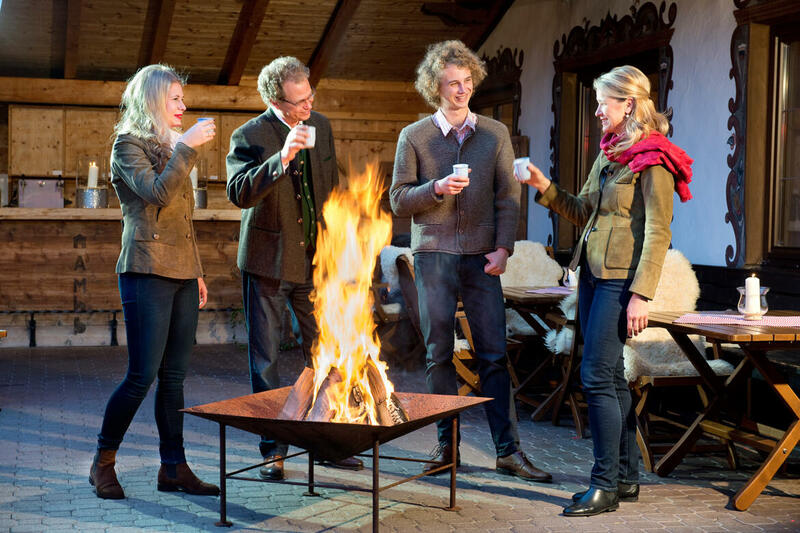 Many interesting personalities from around the world still come to Alpbach and the Hotel Böglerhof every year. Famous guests have included Sir Karl Popper, Erwin Schrödinger, Sir John Eccles, Konrad Lorenz, Arthur Köstler, Helmut Kohl, UN Secretary General Ban Ki Moon, Catherine Ashton and former Austrian president Dr. Heinz Fischer. Relax on holiday in Alpbach. Book your stay at the Hotel Böglerhof today.